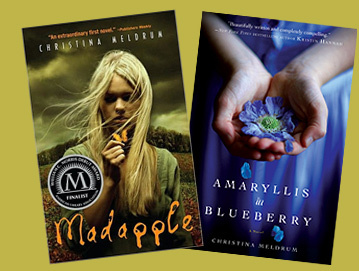 Is your book group reading Madapple or Amaryllis in Blueberry or considering reading them? If so, check out the Reading Group Guide for Amaryllis in Blueberry or the Reading Group Guide for Madapple. Would you like the author to join your reading group? If so, Christina would be happy to attend via telephone, or in person, whenever possible. Christina also would be happy to answer your questions by email. Contact her with your request at christina@christinameldrum.com.